Unique anti-cancer vitamin that protects from radiation, and support immune system, bones and brain functions. 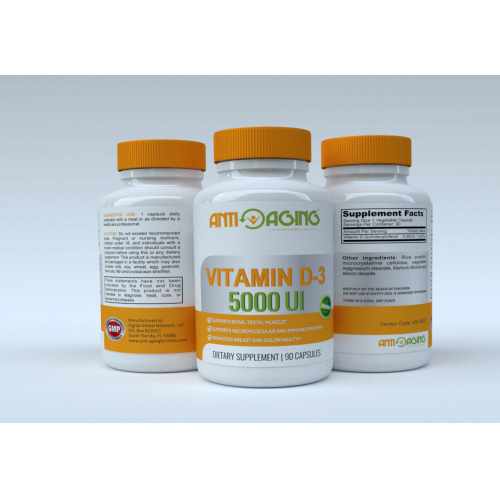 Vitamin D has been in the forefront of the medical world with all of the recent discoveries as to the significance of this essential nutrient for overall health and well being. Nicknamed the Sunshine Vitamin, Vitamin D is unique among all other vitamins because it is the only conditional one and must be synthesized in the skin from exposure to ultraviolet radiation from sunlight. Concerns over skin cancer caused by overexposure to sunlight have prompted many to use sufficient sun block or limit exposure to a degree that can create a deficiency of Vitamin D produced by the body. But, in fact, a lack of Vitamin D is now linked to various forms of cancer including malignant melanoma and colon cancer. 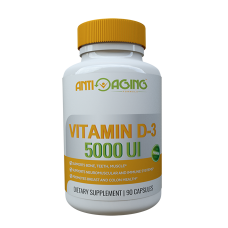 Vitamin D deficiencies can also drastically weaken the immune system, bones and brain function. For these reasons many physicians are now recommending their patients take levels of Vitamin D far in excess of the recognized Daily Value.Available in two forms, Vitamin D-2 (ergocalciferol) and Vitamin D supplements are available in two forms, D-3 (cholecalciferol) which is the natural form and D-2, (ergocalciferol) which is produced by radiating fungus. Vitamin D-3 1500 IU Tablets: Derived from lanolin, each small, easy to swallow tablet provides 1500 IU of natural Vitamin D-3.